The instructor, Dr. Linda Kinnahan, provided the option for students to complete a creative project rather than a traditional paper as a course capstone. 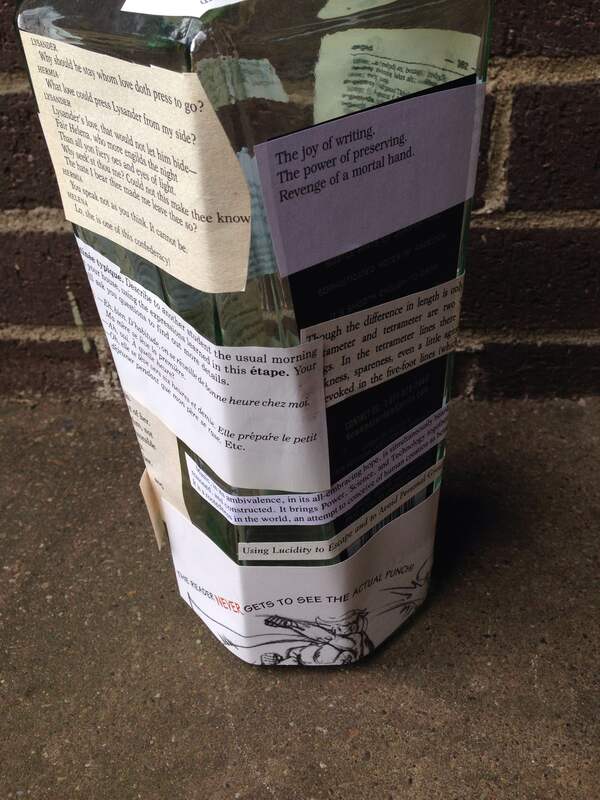 There were no parameters for the creative project, except that it must be related to text(s) from the course syllabus. We were required to submit a brief introduction with our project, in order to explain its relation to the course material. 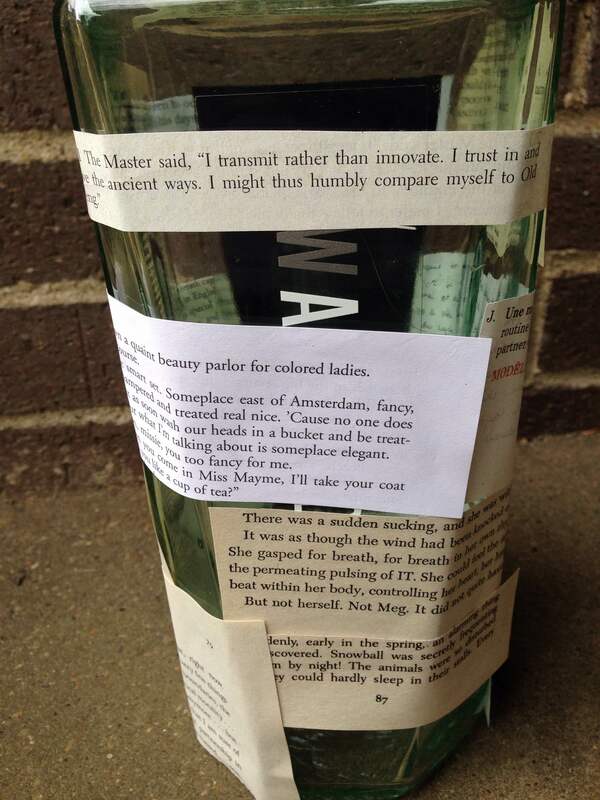 My final project was titled, “Commerce and Creativity in Found Objects.” I combined ideas from Gertrude Stein’s “Tender Buttons” with Marcel Duchamp’s readymades. Both artists explore the familiar object. Stein describes in poetic words the ordinary domestic sphere she finds herself in, while Duchamp displays ordinary objects outside of their utilitarian context. I thought that it would be interesting to take their conceptions further with my own version of the found object. I created three of my own art pieces assembled from found objects. Each of the objects is meant to explore a different aspect of the creative or commercial process associated with artistic tradition and originality. Through this project, I studied the relationship between art and commodification, using research on Gertrude Stein’s Tender Buttons and Marcel Duchamp’s ready-mades. I modeled the project after Tender Buttons’ structure. Like the book, my project contains three components that can be viewed in any order. Rather than a linear progression of ideas, the three objects assert their own relationship to one another as a composition as well as their individual relationship to the outside world. I did not focus on the domestic sphere of Tender Buttons, but rather the artistic sphere, and embarked on a journey of description similar to Stein’s. I chose these particular objects: mannequin arms, a mandolin, and an empty liquor bottle, to represent human consumption and creation. Each of the three objects is of little to no utility in itself: the arms are cracked and separated from their bodies, the mandolin is warped and cannot hold a tune, and the liquor bottle is empty. I altered the arms to portray the artist; the bottle to portray artistic tradition; and the mandolin to portray artistic innovation. The alterations that I made to each of these objects also pays special attention to the internal versus external, like Stein does in Tender Buttons and also to dimensionality, in the combination of texts, images, and objects. In the following paragraphs, I will discuss each component of the project in greater detail. 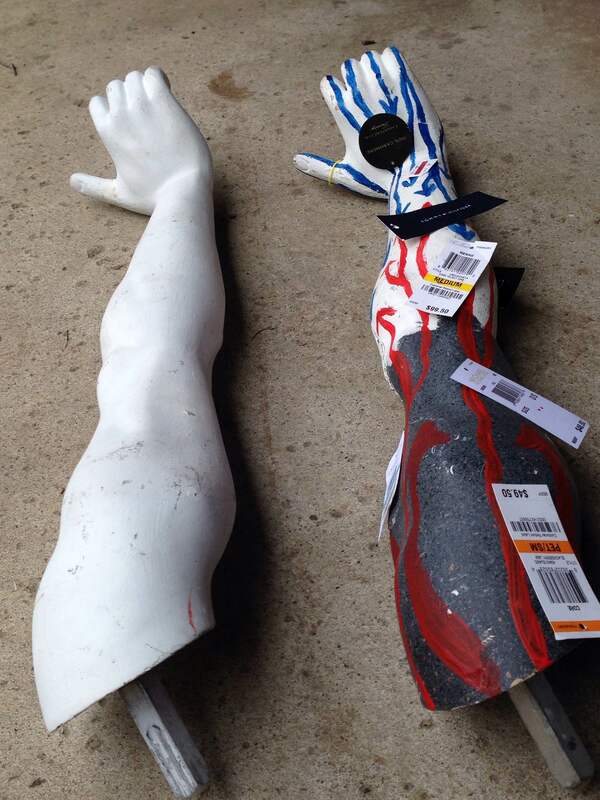 When I first discovered the mannequin arms, I noticed holes in their palms and assumed that they were from a religious statue with stigmata. 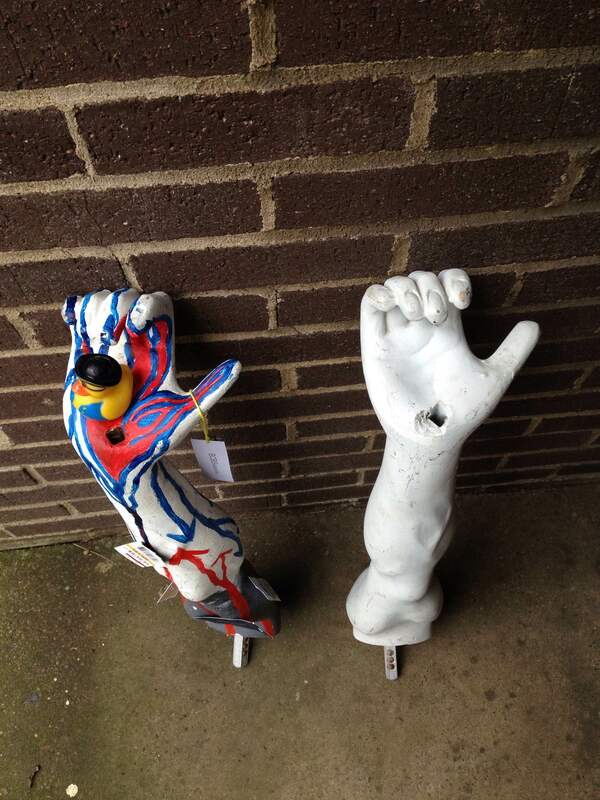 The shopkeeper then informed me that the arms were from mannequins that were displayed in a handstand position and that the holes allowed for pins to keep them upright. My initial impression was that they were a component of an artwork signifying the archetypal Creator—the truth that I learned was that they were instead a component of a device used for commercial purposes. Not only that, but the mannequin was even made to do acrobatics in order to sell merchandise. 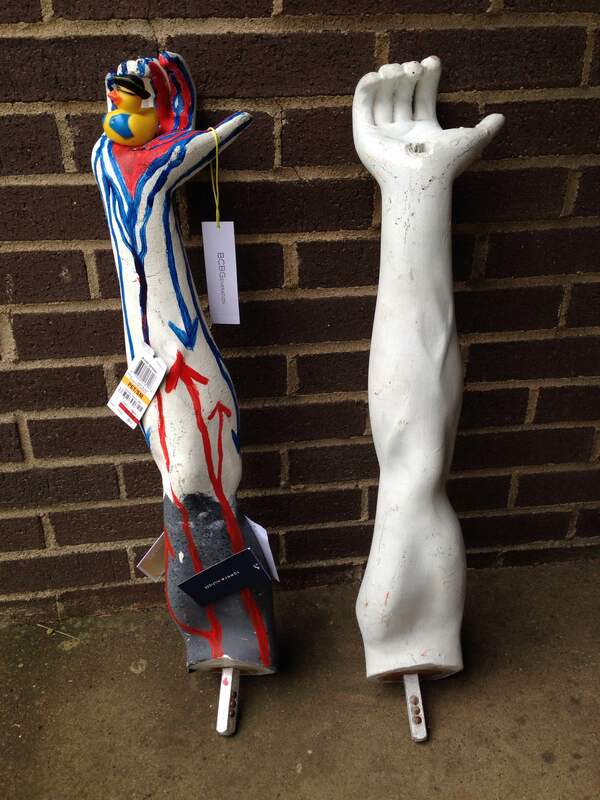 The metaphoric value of the arms, already cheapened in my mind, was lessened even more once I brought them home and noticed that they are two right arms, rather than a matching set. I decided that I would adorn one arm to signify the artist, and leave the other untouched. When laid side-by-side, they remind me of Duchamp’s mass produced ready-mades. The artist is a product of society, and put on display for the public, just as either a manufactured item or a ready-made artwork is produced systematically and cast into the world. Richard Shiff, in his article, “Art and Life: A Metaphoric Relationship,” claims that most artwork is most recognizable in its relation to its period rather than its artist; this alludes to invisible cultural forces that mold contemporary artists in certain uniform ways, either consciously or unconsciously. The mannequin arms, which I initially thought were emblematic of a Divine Creator, turned out to merely be manufactured utilities for commerce; this tension between transcendental meaning and practical economics is inherent to the artist. Red and blue arrows cover the artist’s arm. I used them to evoke blood-flow as a means of thinking about artistic inspiration and intention. The red arrows, flowing from the shoulder, represent the artist’s own personality and intention, while the blue arrows flow from the palm and represent the artist’s educational background and the cultural/socio-political climate that influences his or her work. The external application of such a circulatory system represents the intimate way in which the artist shares his or her psychology with the public. Though blue lines dominate the palm, red, representative of the individual, flows outward from the hole in the palm. In this way, an artist “bleeds” originality, even when their work is fully entrenched in its contemporary culture. Though the work is unique, the extent to which the artist has control over the outcome is debatable, which Stein acknowledged in her attempt to remove herself from the text and instead to write in an impersonal manner. The final effect that I added to the mannequin arms was the rubber duck sitting in the artist’s palm. Though it is silly and far from the realm of fine art, it can represent an artistic commodity that brings value both to the artist and the consumer, a practical compromise summed up in the adage “a bird in the hand is worth two in the bush.” Two birds in the bush could represent an artist who has gained a place within the artistic tradition, which I attempted to depict in the second object that I modified. 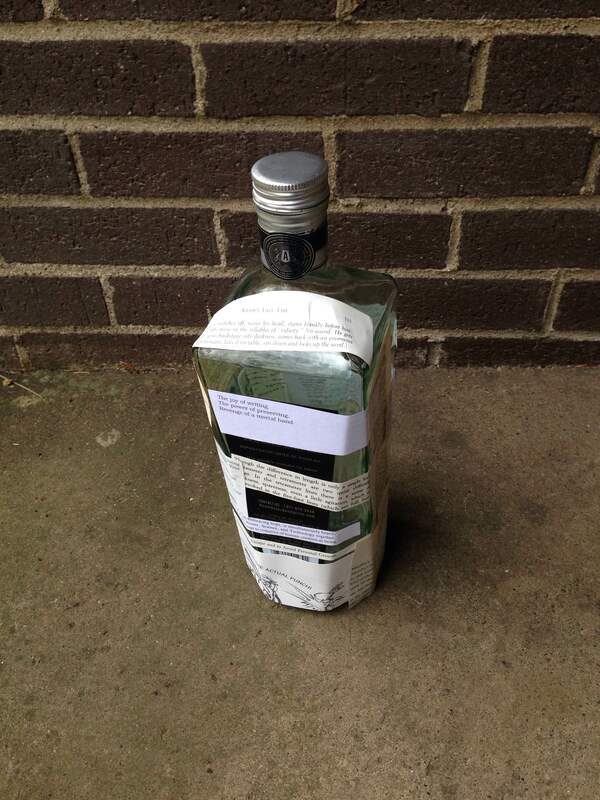 The empty handle of New Amsterdam gin is meant to represent the “cocktail” of artistic education that informs each new artist. The consumption of canonical works and didactic lessons offers the artist both technical advice, knowledge of his or her predecessors, and inspiration; yet, as Shiff reminds us, modern art values originality more than it values technical excellence. 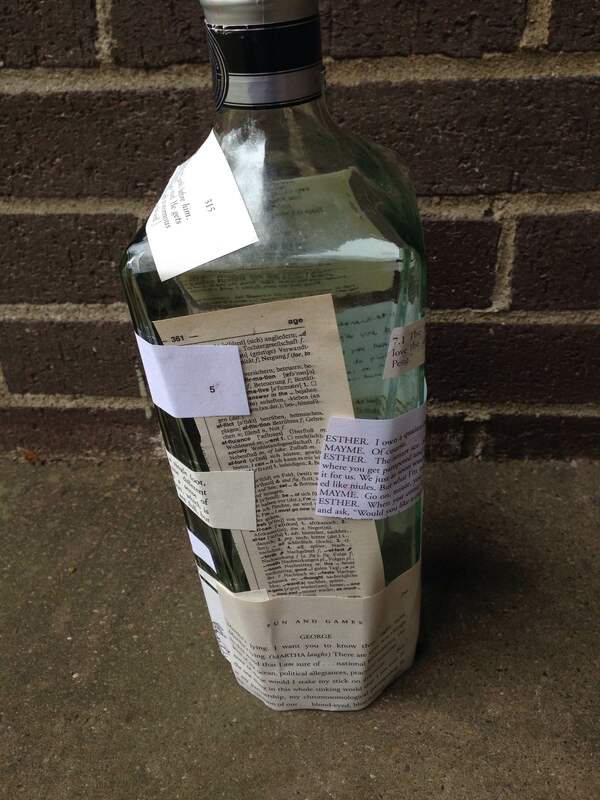 The passages glued to the exterior of the bottle are merely prescriptive; the emptiness within the bottle suggests that each individual artist produces work under the influence of his or her own muse; original ideas are the gateway to economic and historical success in the arts. While each referenced work is itself invaluable, the scraps of paper themselves are worth even less than the empty bottle. Here we find a different kind of commerce from the mannequins, the clothing tags, and the rubber duck. Instead of material value, art seeks ideological value, such that Duchamp both attained and challenged in his innovative ready-mades. 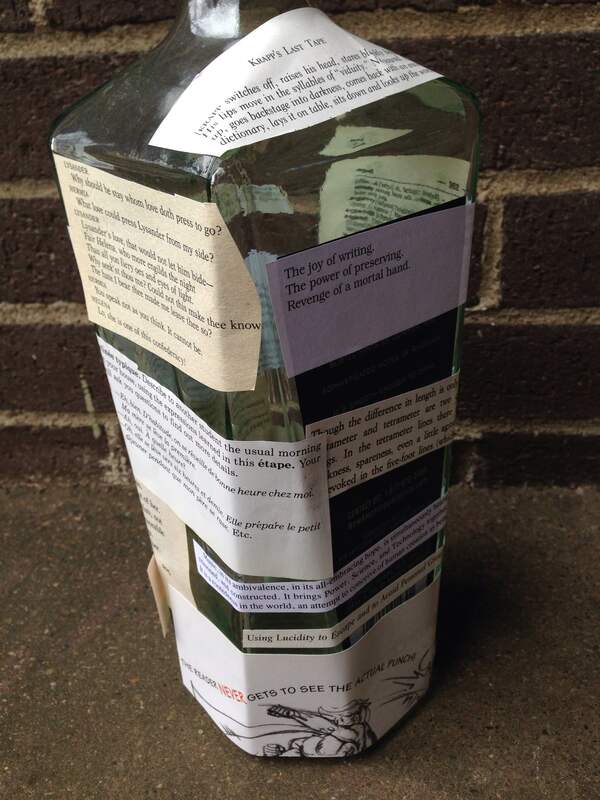 The bottle is also reminiscent of the many containers referenced in Tender Buttons; as Mitrano discusses in her article, “Linguistic Exoticism and Literary Alienation: Gertrude Stein’s ‘Tender Buttons’,” Stein finds her place in the American literary tradition precisely by acknowledging that tradition, then turning her back on it in favor innovation. To represent the distorted way that tradition lives in the artist’s consciousness, I combined classic drama and poetry snippets with more didactic texts, such as language exercises and a lucid dreaming manual. They clutter together in distorted ways, much like education becomes hazy with time, and associations among texts are often personal and arbitrary. While tradition feeds the artist, it is important to remember that tradition is originally artifice itself; though this particular piece of my project represents consumption, it ultimately is both consumption and production, like an ouroborus. There is no beginning nor ending in the creative cycle, as Stein asserts in Tender Buttons. 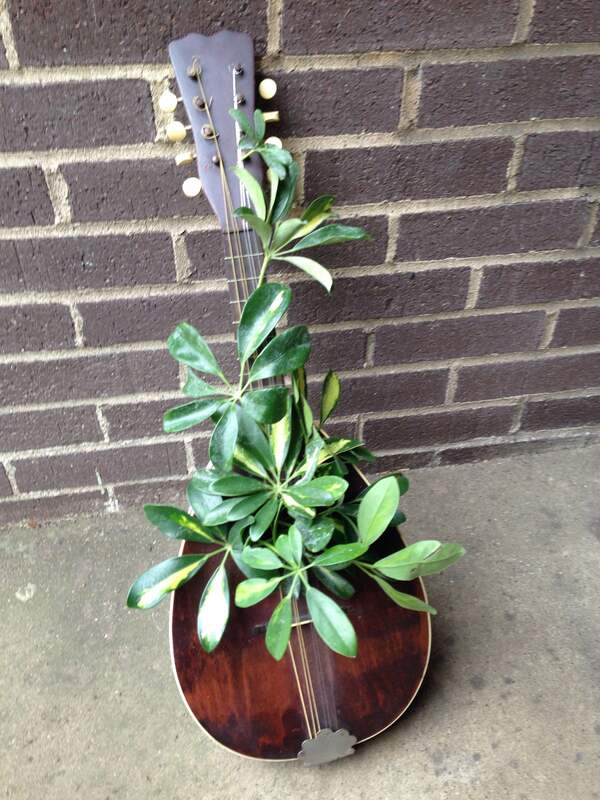 The final piece of my project is the mandolin, which I designed to represent artistic innovation. I chose to use natural images and a real plant to represent innovation because I believe that the evolution of art is organic, communal, and competitive. 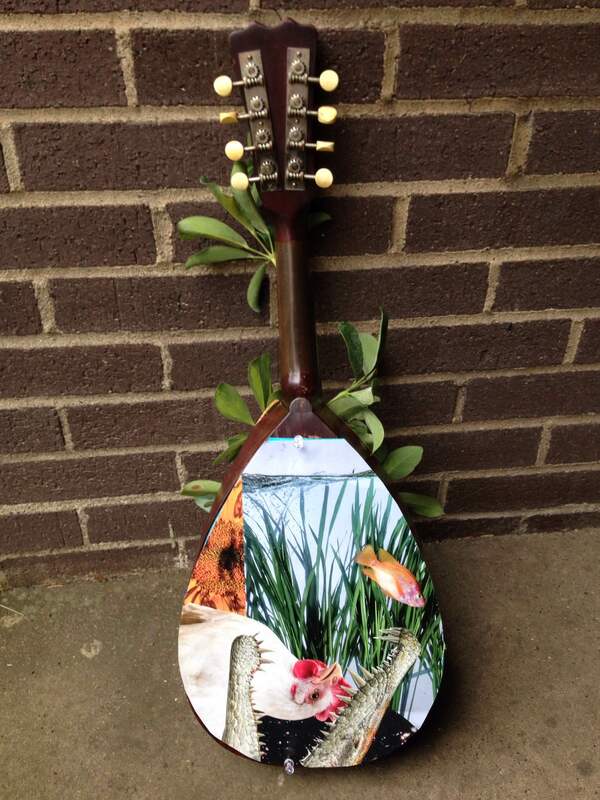 The collage on the mandolin’s back displays natural images in relation to one another; like Stein’s concept of a composition, nature also places various organisms in relation to one another. The dominance of commerce in art and society is a natural occurrence that manifests each time a predator kills its prey. Perhaps for this reason, Duchamp struck a cord when he pulled the economics of his artwork to the forefront of his method, rather than allowing commodification to naturally manifest in his work, or attempting to conceal it, as many artists might. While there isn’t a uniformity, per se, among artists, a sort of natural selection occurs whereby only certain innovations, like genetic mutations, take hold and become canon. I attempted to evoke the synesthetic quality of Stein’s Tender Buttons with the bloom of green leaves emerging from the front of the mandolin, that represent music or artistic creation as a whole. The factors I depicted in the other two components of the project: sociopolitical influences upon the artist, fashion, commerce, the artist’s personality, literary tradition, technical training, and poetic inspiration all converge to give birth a new art that has a vivid life of its own. I first thought to combine Gertrude Stein’s Tender Buttons with Marcel Duchamp’s ready-mades because both utilize the familiar and the concept of the found object. Stein describes in poetic words the ordinary domestic sphere she finds herself in, while Duchamp displays ordinary objects outside of their utilitarian context. I thought that it would be interesting to take their conception of the found object further, to combine worthless objects with adornments that in some way convey value: price tags, canonical texts, and living organisms. Through playing with varying combinations and dimensions of images and texts, I enjoyed an exploration of the meaning of commerce in creation.